Products type: Li-ion battery. 1 x LP-E8 Li-ion Battery. EOS : 350D, 400D. PowerShot: S30, S40, S45, S50, S60, S70, S70a, S80, G7, G9. 2x BATTERY for CANON NB-2L / NB-2LH. 2x Battery. THE SET INCLUDES Capacity: 1000mAh. NB-2L, BP-2L12, BP-2L14, BP-2L18, BP-2L5. Canon Battery Charger LC-E6E (with adapter). Condition is Used. Dispatched with Royal Mail 1st Class. Canon EOS 1100D X50 EOS 1200D. Canon EOS Rebel T3. 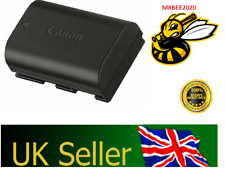 Canon LP-E10 Li-Ion Battery. Compatible with. 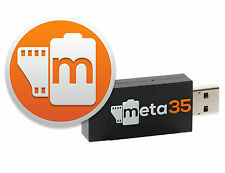 Compatible with Canon 10D/20D/30D/40D/300D etc. Genuine Canon EH19-L semi hard case as new. The item photographed is the item you will receive. Canon EF 100 400mm f/4.5-5.6 IS Mk2 (2014) Neoprene Lens Protection Cover. Harvest Premium rubber backed fabric. - Quality 3mm thick neoprene (poor protection if any thinner, thicker can get in the way). Including the zoom tube cover for use when the lens is fully extended. Canon NB-11L & NB-11LH Li-ion Battery. Canon PowerShot A2300 is, A2400 is, A3400 is, A4000 is. Canon PowerShot ELPH 110 HS, IXUS 125 HS, IXUS 240 HS. Output: 4.2V 0.41A. Canon EOS 550D, 600D, 650D, 700D, Rebel T2, Rebel T2i, Rebel T3i, Kiss X4, X5. Note:(item used ,but good quality good item ）. You may also like. ). Canon LP-E6 Battery (But LP-E6 is no compatible for LP-E6N). Products type: Li-ion battery. 1 x LP-E6N Li-ion Battery. Half year warranty. Canon LP-E10 Lithium-Ion Battery. EU safety certified. 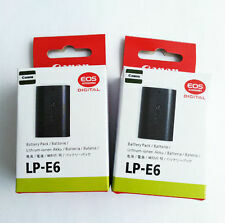 Canon LP-E6 Battery for EOS 5D III EOS 7D, EOS 6D. All the lens covers I make are made by myself by hand on a lock stitch and overlock machines. The aperture for the switch bank by default is glazed but I use this lens myself and prefer it unglazed. Genuine Canon LH-B8 Hard Lens Case Black 3.5" x 3.5"
Genuine Canon LH-B8 Hard Lens Case Black (H: 3.5" x Dia 3"). Canon EOS 5D Mark III，EOS 5D Mark II，5DS, 5DSR, EOS 6D，EOS 7D，EOS 70D，EOS 80D EOS 60D，EOS 60Da. Original Genuine Canon LP-E6 battery. Canon LP-E6 LP-E6N Battery. 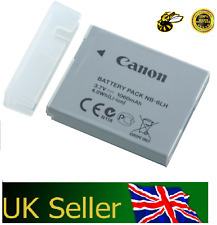 1 x Genuine Canon LP-E6 battery. Battery use, quality is good, if there is quality problems. Canon PowerShot, A2600, A3500,A2300 is, A2400 is ,A2500 IS, A3400 iS,A3500 IS, A4000 iS. IXUS IXUS 160 ,IXUS 165 ,IXUS 170. ixus 265 hs, IXUS 157 IXUS 155 ,IXUS 150 ,IXUS 147,IXUS 145. Canon EOS 550D, 600D, 650D, 700D, Rebel T2, Rebel T2i, Rebel T3i, Kiss X4, X5. 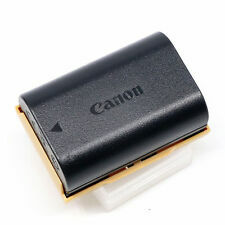 Canon LP-E8 battery. or other conditions. It opens to reveal a black / grey interior with 1 padded divider which can be moved to adjust your particular needs. There are extra accessory pockets to the front and rear. This bag has a black fabric exterior with Grey trim to the top. Canon EF 100-400mm f/4.5-5.6L IS II (2014) Neoprene Lens Protection Cover AP Premium. - Quality 3mm thick neoprene (poor protection if any thinner, thicker can get in the way). - Comfort and insulation from handling cold lenses. Canon PowerShot SX720 HS G7 X MARK II G7X G5 G9X. 100% Genuine Canon NB-13L Battery. Manufacturer: Canon. 1 x Genuine Canon NB-13L Li-Ion Battery. Products type: Li-ion battery. Nikon Photographers Vest (XL) - BRAND NEW. Nikon Logo. Size XL (tried on person who is 6.2" and fits perfectly). Canon EOS 550D, 600D, 650D, 700D, Rebel T2, Rebel T2i, Rebel T3i, Kiss X4, X5. 1 x New Genuine Canon LP-E8 Li-ion Battery. Manufacturer: Canon. Products type: Li-ion battery. You may also like. The bag is in Excellent Condition. Photos - these pictures are of the actual item up for sale and provide a clear indication of its condition. Canon EF 100 400mm f/4.5-5.6 IS Mk2 (2014) Neoprene Lens Protection Cover. - Quality 3mm thick neoprene (poor protection if any thinner, thicker can get in the way). - Comfort and insulation from handling cold lenses. Canon Green & Tan Shoulder carry case. It's a used item so obviously shows signs of use, but only those consistent with light normal use. Condition / Colour. This bag has an attractive 2-tone Green and Cream fabric exterior, with Brown dividers internally. Gallus : 1100 mm. High Quality 100% new. 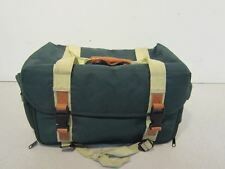 Genuine Canon case made in Japan in Excellent condition. The Neoprene is lined on the inside in black and is reversible if you prefer plain black. I am now putting a hole in the hood for the tension screw which makes it more secure and it fits flatter, the one in the photo hasn't got a tension screw hole. Works With: EOS M, EOS Rebel SL1. Battery Series: Canon LP-E12. It has a divider system for secure storage and easy access. Canon ES-100 SLR Camera Bag. New and Sealed.